TSA Agents Discovered 2,212 Guns At Airport Checkpoints In 2014 : The Two-Way Grenades and blades were also found. In most cases, people forgot they had them. Our favorite discovery: a knife in an enchilada. The TSA said "the passenger's intent was delicious, not malicious." TSA agents, like this one at Chicago's Midway International Airport, discovered more than 2,000 firearms at the nation's airports last year — the overwhelming majority of them loaded, according to new data. The Transportation Security Administration found more than 2,000 firearms at the nation's airports last year — the overwhelming majority of them loaded, the Department of Homeland Security said today. TSA agents discovered 2,212 firearms — or a little more than six a day — in carry-on bags; 83 percent of them were loaded, the department said. The number was a 22 percent increase from 2013, when 1,813 firearms were discovered. 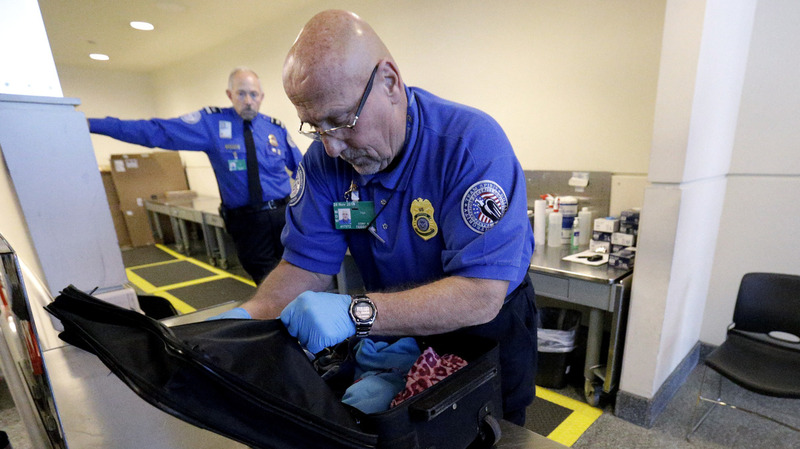 The number of firearms discovered at TSA checkpoints has risen nearly every year since 2005. Also last year, the department said, more than 1,400 "firearm components, replica firearms, stun guns, and other similar dangerous objects were discovered" in carry-on luggage. The top five airports for firearms discoveries are: Dallas/Fort Worth International (120 firearms), Hartsfield-Jackson Atlanta International Airport (109), Phoenix Sky Harbor International Airport (78), Houston's George Bush Intercontinental Airport (77) and Denver International Airport (70). Agents discovered not just small firearms, but a grenade and an assault rifle (unloaded) with three loaded magazines. "In many cases, people simply forgot they had these items," the TSA said in its blog reviewing the data. Agents also found a disassembled .22-caliber gun in a carry-on bag at New York's John F. Kennedy International Airport. The gun's various components were found hidden inside a PlayStation 2 console. Agents also stopped a 94-year-old man who tried to enter the checkpoint at New York's LaGuardia Airport with a loaded .38-caliber revolver clipped to his belt. An 8.5" knife was discovered in an enchilada at the Charles M. Schulz–Sonoma County Airport. The TSA noted that "While this was a great catch, the passenger's intent was delicious, not malicious, and she was cleared for travel." A 3-inch knife concealed inside a laptop's hard drive caddy. A saw blade in a Bible, a cell phone knife case, a lipstick stun gun.